IF YOU ARE BORN ON FEBRUARY 16, you are enthusiastic! 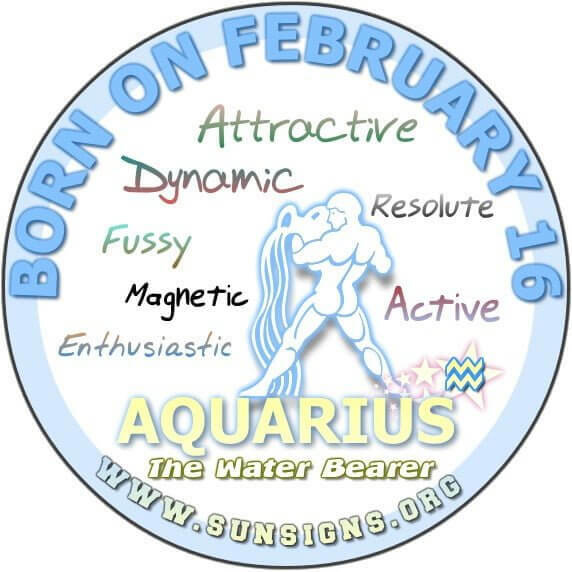 If today is your birthday, then you are an Aquarius. How could anyone mistake you for doom and gloom? You are dynamic and strong-willed. 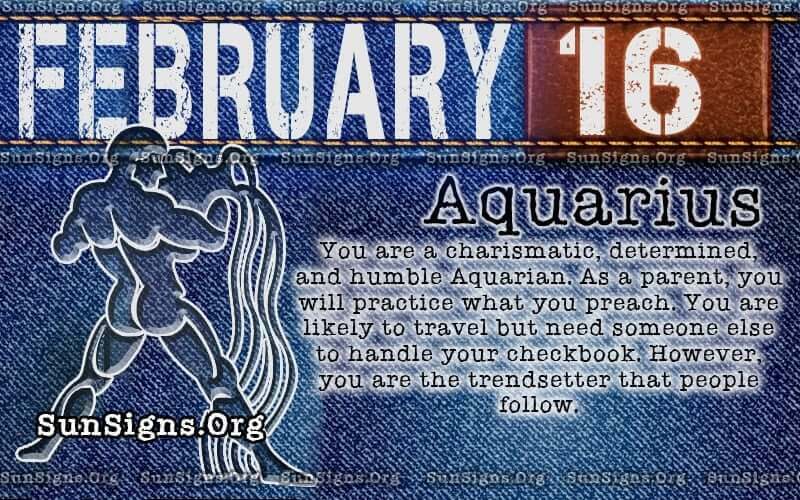 You are charming, Aquarius. You make the world go around you. All of these things say that you have a magnetic personality that attracts people. In spite of it all, you remain humble, and you are a gift to others. Justice appeals to your sensitive nature. Those with a February 16 birthday can keep calm and see both views when debates arise. Your motto is “Truth is 100% factual, but it doesn’t care who it comes from.” A 3-year-old can make a valid point. You just have to listen. When it comes to parenting, you will make a fine one. Whether you decide to allow your children space in which to make their own mistakes and grow or to discipline them with strong ties to values, patience, and humility, you will be fine. Whatever you decide to do, it will hold firm to your principles. Most Aquarians born on this day take their roles as a parent seriously and find it much easier as time goes by. You will lead by example. What your birthday says about you, it that, Aquarians prefer to set their standards. Some would rather shop at a boutique or small business than to go to the overcrowded and overpriced mall. You will have better luck at finding one of a kind clothing or shoes in those shops anyway. I mean, who should be concerned about what “they” are wearing when “they” should be worried about what You are wearing. You are Aquarius, and you set your style. Oh, do not forget to add a touch of turquoise jewelry on you. Now, you look gorgeous! You are ready to travel. As your February 16 birthday horoscope predicts, you are always on the go whether it is business related or you are doing something for your friends and family. Won’t any grass grow under your feet? You do not need a reason other than the wind is blowing to travel. You love to go to new places. Aquarians will just go. It is wonderful, freedom is. Free to be spontaneous is a luxury you work hard to obtain. Money is never an issue with you. You know its value, however; you seem to place little importance on it. You know, Aquarius, you should think about getting an accountant to handle your business affairs or maybe a financial consultant to help you invest and grow your dollar. Those with a February 16 birthday, are friendly. You can make a friend with ease, but the question is will you cultivate the friendship or not. Bear in mind, however, every one you meet is not your friend. To get one Aquarius, you have to be one. Your birthday horoscope profile shows that you cannot expect others to open up to you when you never return the favor. Be truly honest with people and let them know how you feel, what you want and need. There are two things guaranteed about an Aquarius zodiac birthday, and that is 1) You fear losing control and 2) You fear to lose your freedom. If you suspect that a friend was becoming too needy, you will leave that friend hanging. Aquarius, you would disappear! You cannot put restrictions on Aquarians. This is a deal breaker for those with February 16 birthdays. Let us wrap it up, Aquarius. According to your birthday astrology analysis, you are enthusiastic and dynamic. This is an excellent combination to have on the Air team. You are honest and know that wisdom comes from strange places. You value your freedom more than you do anyone that is trying to take it from you. You cannot put a cage on those born on February 16, a true Aquarian. Your ruling planet is Uranus that symbolizes innovations, originality, upheavals, and rebellions. Your Birthday Tarot Card is The Tower. This card symbolizes drastic changes, problems, and situations. The Minor Arcana cards are Seven of Swords and King of Cups. You are most compatible with people born under Sagittarius: This is a positive and lively relationship. You are not compatible with people born under Scorpio: This can be a very vulnerable relationship. Number 7 – This is an introspective number that stands for contemplation, understanding, and wisdom. Number 8 – This is a diplomatic number that shows the will to be successful and powerful. Blue: This is a peaceful color that symbolizes balance, reliability, loyalty, and purity. Lavender: This color is a metaphysical color that symbolizes balance, spirituality, modesty and wealth. Saturday – This day is ruled by Saturn. It stands for dedication, patience, and planning. Monday – This day ruled by Moon stands for intuition, sensitivity, and emotions. Amethyst is a gemstone known for its metaphysical, healing and spiritual properties. Scuba diving lessons for the man and a pretty beaded necklace for the woman. February 16 birthday horoscope predicts that you love traveling and exploring new places.